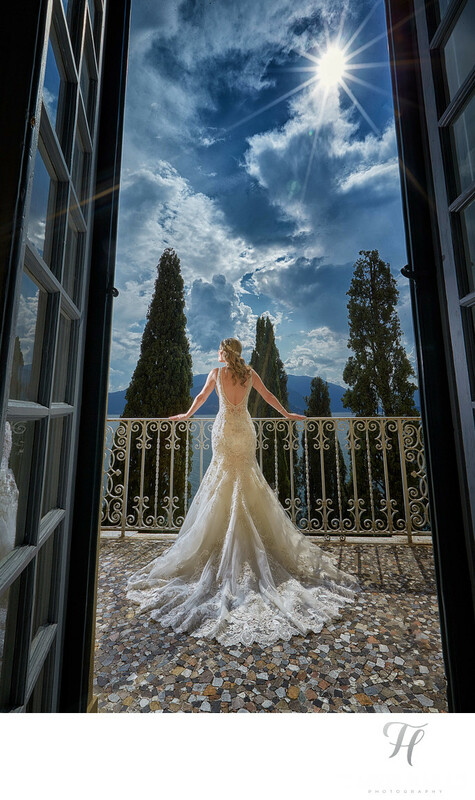 It was the wedding day in Lake Como, Italy and we were at the beautiful Hotel Villa Cipressi. Both myself and my assistant had gone there the day before, and had some great ideas of where we wanted to shoot some of the styled shots of our bride on the wedding day, and this was one of them. I got very lucky, that we had a nice sunny day. I decided to use the sun as apart of my dramatic composition, and made the starburst effect by stopping down my lens to f/18. I then took my assistant Chris, and placed him outside on the terrace (camera left) and gave him my powerful studio light to provide a nice light on my bride. I stayed inside (both for the cool composition, and because I was hot! LOL) and shot through the doorway, and this was the resulting image! I absolutely love it, and both my bride and the hotel are crazy about it! It also performed the best out of ALL my other images on Instagram with hundreds of "likes". Check out this quick 60-sec preview of the behind the scenes from this epic wedding trip to Lake Como, Italy! You can also see the FULL blog post with many more images from this wedding, as well as two other videos here!. Location: Via IV Novembre 22, 23829 Varenna (LC) Italy.